I honestly didn’t watch more than a few episodes of The Walking Dead TV show and haven’t read the comics. That wasn’t because I didn’t like the show or because I had something against it, I just never got around to watching more of it. I’m sure one day I will. 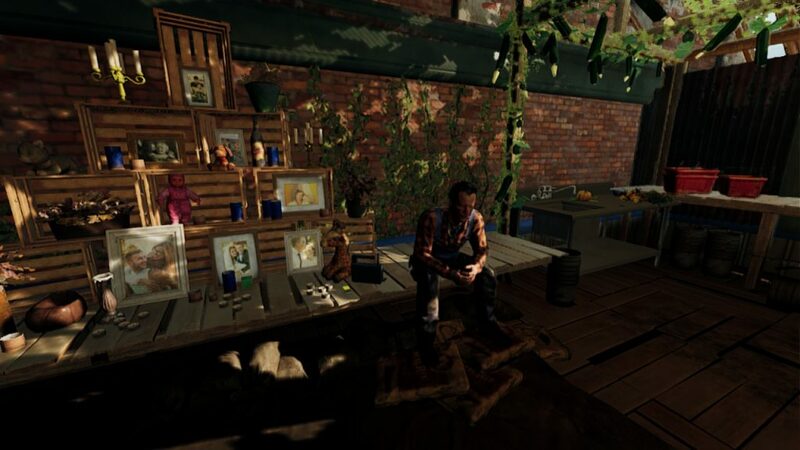 In Overkill’s The Walking Dead, you play as one of four survivors who has established a camp, in order to protect themselves from the hordes of zombies. Or “Walkers.” Throughout the game you have to protect the camp by shooting down invading walkers, rebuilding and improving defences. You also have to go out to look for supplies and take down a rival group of surviving humans known as “The Family. (Who totally started it!) 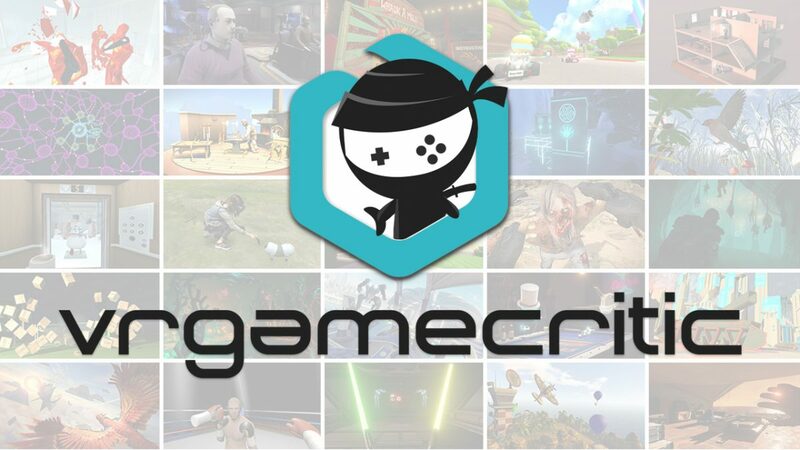 You can play missions by yourself, but if you don’t want to get completed torn apart, you can also play with other humans online, in teams of up to four. Not knowing much about Overkill’s The Walking Dead, when I first started it up, I decided to watch the tutorial video- since this is usually a good place to start when playing a new game. However, there wasn’t much tutorial to it. (In that it gave more tips on how to play the game, than instructions.) Having said that, it was a great window into how the game relates to its inspiration. It immediately starts talking about the comics and how the characters in the game relate to the book-canon characters. It honestly gave the game a “fan-fiction” vibe. Not that there is anything wrong with that! That definitely isn’t a criticism. I love fan-fiction and the passion behind it. This project was certainly one with a lot of passion and a lot of work. But what else is cool is that the game doesn’t rely on the player having an extensive knowledge of the comics or tv-show. I’m sure there are plenty of fun Easter eggs for fans of the comic, but the game still flowed well and stayed interesting without any knowledge of the fandom. The game still managed to appeal to me. It’s rare to see that in games based in fandoms: I can’t imagine someone who has never seen Rick and Morty desperate to play Virtual Rick-Ality. 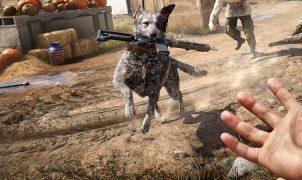 My main issues with the multi-player aspect of Overkill’s The Walking Dead are mostly just my issues with multi-player games. It was never hard to find a complete team, but I couldn’t help but feel I was already late to the game. Whenever I started one of the early missions, it felt like everyone else in my team already knew what to do and we’re just repeating it for the experience. Obviously, that’s a logical move in these kinds of tactical games, but since they just ran off and did the mission, it meant I finished the mission with no idea how to finish the mission. 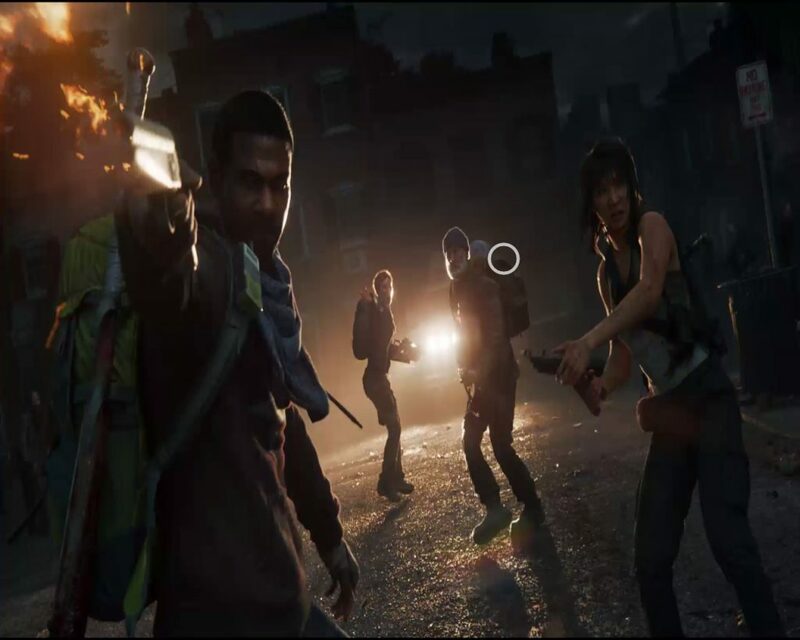 Again, this isn’t necessarily Overkill’s The Walking Dead’s problem, but I think it could be solved by developing a single-player “easy mode”, so players can explore the area themselves before going into a game. Or I guess you could find three friends to play the game with. My absolute favourite thing about this game is that it’s very melee weapon heavy. If you use guns, Walkers will be attracted to the noise and come to swarm you. So, you encouraged to literally hack their heads off with the best weapons you can find! This is just so much more interesting than shooting things. It’s much more satisfying to hack someone’s head off with a knife than stand back and pick them off with a gun. Of course, it helps that the game is visually amazing. I remember one fond moment where I just stood by and watch the intestines of the walkers flying across the screen. You can’t have a zombie apocalypse game without realistic blood and body parts. There are so many different weapons in the game to use, I found myself repeating early missions just to try them all out. Even though zombies surround you in pretty much every task you undertake, the combat never feels repetitive. Sure, you’re still smacking zombies in the head, but it’s just as satisfying the fiftieth time around as the first. Although the multi-player version is a more balanced way to play the game, I still took great pleasure in going into missions on my own. Just to run around and hack at zombies. Sure, they ate me most times, but I had fun! 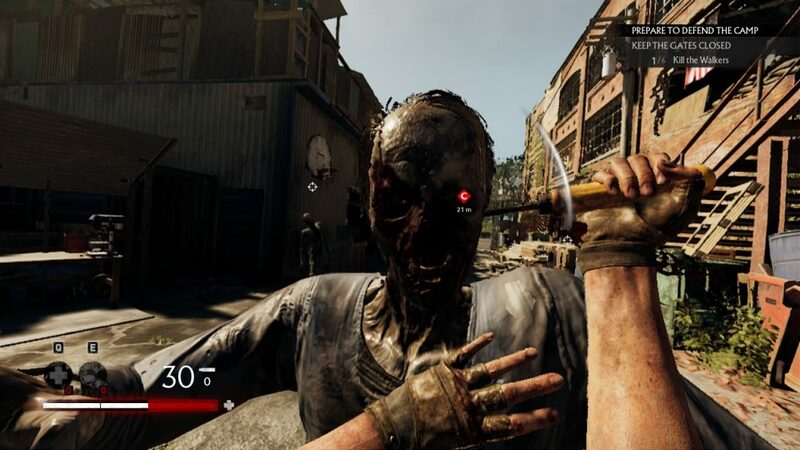 While completing the story missions and fighting zombies is the main point of Overkill’s The Walking Dead, it’s not the only element to it. You also have to build up your camp’s defences with things you find on missions and keep it safe. 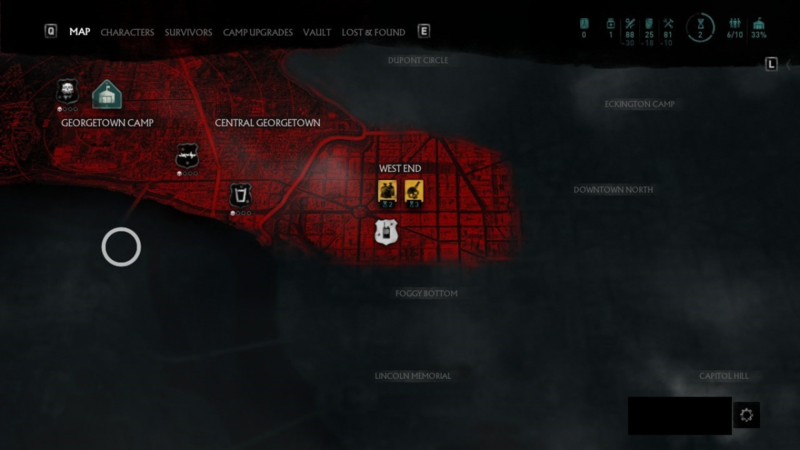 After missions, you’ll recruit other survivors who will do tasks for you and go on missions. 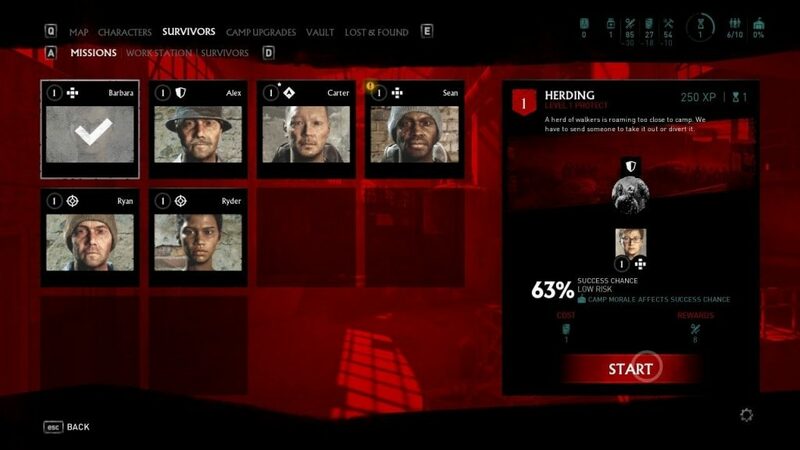 When you select a survivor for a mission, you’ll get a percentage for how likely the survivor will succeed at the mission; which most of the time was pretty accurate. You also have to choose improvements for your camp and improvements for your game characters. This doesn’t take up a big part of the game, around five minutes in-between missions, but it’s pretty great having this tactical side thrown into it. Sure, there are is a lot of logic that needs to be applied to the combat, but it’s mostly when you should or shouldn’t attack the zombies. It’s also great to have a part of the game that’s just for you. Since the combat relies so heavily on other people. I probably will play some more of Overkill’s The Walking Dead after this, but I’ll probably try to seek out a team before entering the game. Either that or I’ll just struggle through on my own. But that’s fine too – I’m not great at this game, but I don’t feel I need to be. I still have fun even when I’m getting torn apart by the Walkers. Then again, it’s a little too corny to be overly emotional. Like all the family pictures hanging in the camp! But maybe I’m just heartless. I don’t want to kick the game in my conclusion, overall I enjoyed the game. It’s a perfectly fine zombie, survival, combat game with interesting missions and great visuals. Maybe after this, I’ll go read The Walking Dead and appreciate it more! 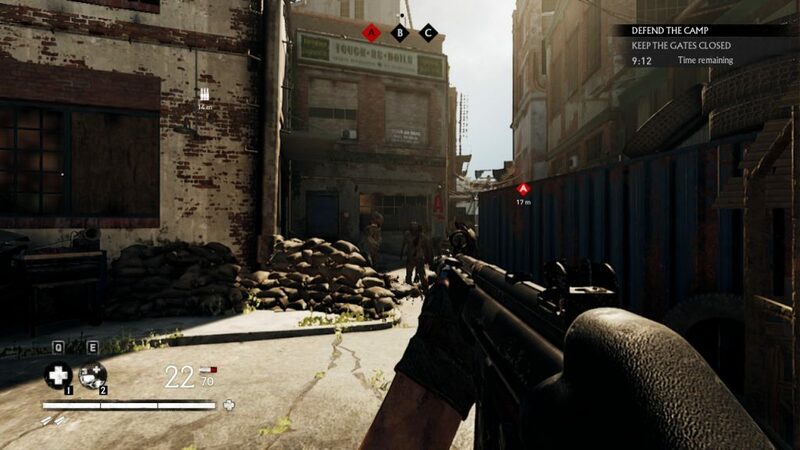 Available on: PC (Reviewed), PlayStation 4, Xbox One; Publisher: Starbreeze Publishing AB; Developer: OVERKILL – a Starbreeze Studio. ; Players: multi-player; Released: November 6th, 2018; MSRP: $59.99. Full disclosure: this review is based on a Steam Review copy of Overkill’s The Walking Dead given to HeyPoorPlayer by the publisher.